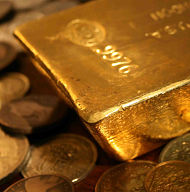 I WANT to look at gold and the large gold miners, writes Dominic Frisby at MoneyWeek magazine. I'll consider the relative performance of the two and ask: which is the better investment? As my measure of gold miners, I am going to use the HUI (or, to give it its full title, the NYSE Arca Gold BUGS index). BUGS stands for "basket of unhedged gold stocks", meaning these companies do not hedge. What does "hedge" mean? 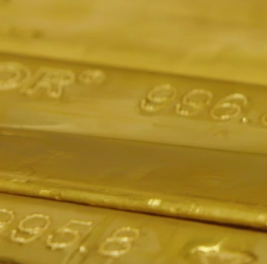 Some companies will sell their gold before they have actually mined it in order to guarantee a certain price. This practice – hedging – reduces risk. They know they will get this price for their metal. But hedging can be disastrous in a bull market: you lock in a certain price, the gold price goes up, and you are forced to sell your gold at the lower price. You lose the benefits of the bull market. After the bear markets of the 1980s and '90s, many miners carried this practice of hedging over into the 2000s and were made to look like fools, as they were selling their gold at $350 and $400 an ounce, when gold was $750 or $800. However, I stress that hedging can be a saviour in a bear market. You sell your gold at $500 and it falls to $250 – you're a genius. This first chart shows the relative performance of the two since 2000 overlaid. Gold is in gold and the miners are in dark blue. You can see that over the last 18 years gold has gone from below $300 an ounce to $1350, or thereabouts, yesterday. The HUI has gone from just below $75 to $182. So the HUI is up around 150%, while gold is up around 350%. In terms of relative performance, in short, gold has annihilated the miners. Miners are supposed to provide leverage to the gold price. That is why one speculates in them. If gold rises, say, 20% or 30%, you should be looking at at least a 50% gain in the mining company. After all, you are taking on the additional risk of buying a mining company – the risk of the competence of the management, the political risk, the operational risk – and the compensation for that risk is the reward of greater gains. Except that palpably has not happened. You would have been far better off just buying the metal. Far less risk; far greater gain. Management of mining companies have to take a lot of responsibility for this. They haven't run their companies well. Incompetence is a sector-wide affliction. Bad decision follows bad decision. Companies are often run in the interests of management, not shareholders. But there are other factors. Mining is getting much harder. Grade (the quality of the metal taken out of the ground) is declining. Political risk, from environmental campaigning to sudden, unexpected taxes to asset-seizing by dictators, is everywhere. Input costs keep growing. If you look at the chart, you'll see that the miners really did outperform the metal by some distance from 2000 to 2008. They sold off by more in the financial crisis, but you'd expect that. In the period from 2009 to 2011 the two more or less matched each other. The bear market that followed was what really separated the two. 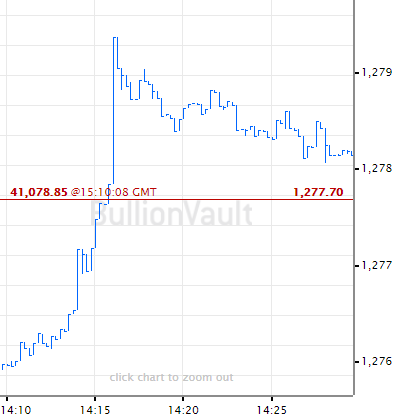 Gold went from $1920 to $1050 – a loss of 45%. The miners went from $50 to $6. They lost almost 90%. They certainly gave you the required leverage then. So, at this point, you're thinking: the leverage on the downside is considerably more than on the upside. What's the point? The one saving grace comes in the year 2016. The first half was a good one for gold. It rose about 30%. The miners, coming off oversold levels, rose by 170% – they almost tripled. The issue is timing. If you can time your entries and exits well, then mining is a good game to play. Timing – easy to say, not so easy to do. The main problem for the miners is that it has become easier to buy gold. In the financial crisis of the 1930s, Homestake, at the time North America and possibly the world's largest gold miner, was one of the stand-out performers. Many cite this as a reason to own gold miners during financially tumultuous times. However, what many people forget is that during the 1930s, Americans were not allowed to own gold. So Homestake became a proxy. It was Americans' only way of getting exposure to the gold price. Today the reverse has happened. It has become incredibly easy to own gold. There are numerous ways an investor can gain access. You can go to a bullion dealer and buy physical bullion. You can use one of the online dealers. 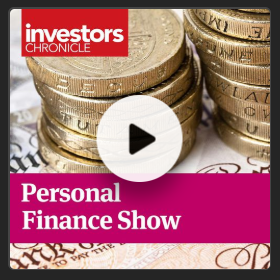 There are exchange-traded funds and a host of leveraged products from spreadbetting and CFDs to options and futures. These products proliferated in the mid-2000s. As they did so, the gold miners began to lose their edge. If you want leverage to the gold price, then buy a leveraged product. You don't need to take on the added company risk of a miner. 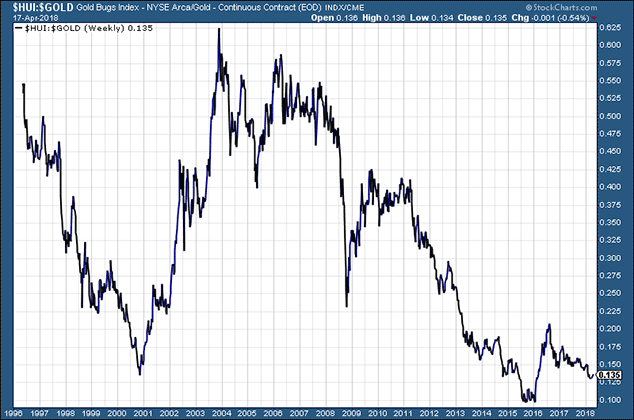 This chart shows the ratio between gold and the large miners going all the way back to 1996. When it is rising, the miners are outperforming gold. When it is falling, gold is outperforming. You can see that, bar a few relief rallies, gold has dramatically outperformed the miners since the mid-2000s, when alternative gold investment products began to proliferate. 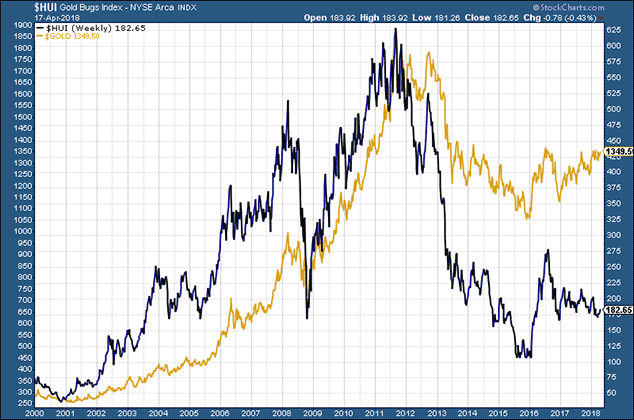 So, to answer the question: "Should I buy gold or large mining companies?" The short answer is "buy gold". There are reasons to buy large miners. Perhaps the market is heavily oversold, as it was in 2001, 2008 or 2016 – and you want to trade a relief rally. Perhaps there is some kind of special situation – although these are more common in juniors, which are a different beast altogether. But if your strategy is buy and hold, or buy and forget, go for the metal, not the miners. Mining companies need to recognise this, and then do something with their companies to make them attractive again. Otherwise investors will continue to favour the metal.